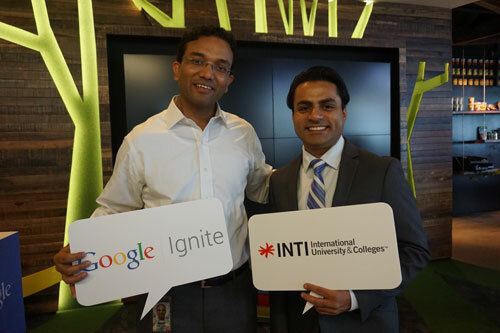 Rohit Sharma, CEO of INTI International University & Colleges (right) together with Sajith Sivanandan, Managing Director of Google Malaysia during the launch of Google Ignite. The partnership, which is set to kick-start in September 2015 will see over 100 INTI students take part in the Google Ignite pilot, which is an exclusive training programme for university students to learn and experience digital marketing and kick-start their career. “INTI is extremely proud to collaborate with Google Malaysia to run this pilot programme, which will not only provide our students with practical and relevant skills that are sought after by employers but also allow them to stand out from the crowd as they will be among the first with this valuable certification,” said Rohit Sharma, Chief Executive Officer of INTI International University & Colleges. “In recent years there has been a massive change in how consumers engage and consume information, especially in the digital space. Thus, more and more employers are looking for graduates with the relevant marketing and advertising skills to capitalise from this shift in consumer behaviour. Therefore, this certification is extremely timely and will add yet another highly valuable skill in our students’ resume, thus jump-starting their digital marketing careers,” Sharma added. The Google Ignite programme will be offered at INTI campuses in Nilai, Subang, Kuala Lumpur, Penang and Kota Kinabalu, and will form part of selected Marketing and Advertising courses for degree level students. The programme consists of three modules that include the basic fundamentals of digital marketing to more advanced courses, such as search and digital display advertising. Once students have completed the course and receive the certification, they will be invited to attend an exclusive career fair, hosted by Google where they have the opportunity to apply for internship programmes with top employers. INTI students often have the opportunity to learn relevant industry skills, due to INTI’s close ties with industry. Other than training programmes such as Google Ignite, students also get the chance to work with industry on projects that may have actual and immediate impact on participating companies, which enable students to develop employability and soft skills that include creativity, communication, critical thinking and collaboration. Working with industry and learning through innovative means have brought about real benefits to INTI students when they graduate and start working, as INTI graduates earn the highest average first job salaries in Malaysia and 96% of them are employed within twelve months of graduation (INTI Graduate Employability Survey 2014, by Millward Brown).